Martha L., a 16-year-old girl who likes to text-messages her friends, had been experiencing pain in the area of her right first finger joint near the palm (right Metacarpal Phalangeal MCP joint) for about four months. As a new fassion, she spent two to three hours per day text message to her friends, and constantly opening and closing her hand at the exact point where she experienced the pain, tenderness and redness (at the joint of her right index finger). She ignored the condition for a month, but the pain became worse and she had difficulty extending the index finger, as well as feeling her knuckles keeping her finger from sliding in and out, Her finger would sometimes get locked into a bent condition. Upon examining her, I discovered that she could bend the knuckle located at the joint of the base of the right index finger, but had difficulty extending her first finger. When I forced her to extend this finger, she felt extreme pain, though this manipulation did succeed in extending the finger. She reported that in the mornings she could not move the finger at all until she had immersed it in hot water for ten minutes. Martha suffers from a condition known as trigger finger, which is the snapping of the digits of the hand when opened or closed. Trigger finger was first noted in soldiers who could not fire their weapons, due to inflammation of the right index finger through repeated use. This condition is also called stenosing tenosynovitis, and involves the hand’s pulley and tendon system that governs the bending of the fingers. The pulley at the base of the finger becomes too thick, constricting the tendons, making it difficult for the finger to move freely through the pulley. Sometimes the tendon develops a knot or swelling at the base of the index finger. Trigger finger is different from a Dupuytren’s Contracture, which is a condition that causes the thickening and shortening of the connective tissue in the palm of the hand. Trigger finger, on the other hand, is characterized by inflammation at the pulley system of the finger that prevents the tendon from freely moving in and out of the pulley system (i.e the index finger is unable to flex or extend freely). Trigger finger most commonly affects the index finger – or thumb, following more and more young generation involving in computer games and text message, more thumb trigger finger cases are showing up – and starts with discomfort felt at the base of the finger or thumb where they join the palm. The area often feels tender when pressure is applied, and a nodule may sometimes be found in this area. The patient often thinks there is a problem with the middle or tip knuckle of the digit after a nodule is found in this area. 1. Gender: trigger finger more often affects men than women. 2. Repetitive grinding and gripping of knuckles such as repeated use of power tools or musical instruments (i.e. bows for violins, cellos, etc.) or now people frequently text massage for an extended period. 3. Some medical conditions such as rheumatoid arthritis, diabetes, hypothyroidism, amyloidosis, tuberculosis, etc., leave patients more prone to developing trigger finger. 1. Rest. I always strongly advise the patient to rest the affected finger, with no gripping and no repetitive opening and closing other hand. 2. Splinting. A splint can help keep the finger in the extended position, which rests the joint and decreases the inflammation. The brace may have to be worn for as long as six weeks. 3. Soaking and massage. The patient is instructed to immerse the afflicted finger in hot water each morning for 15 to 20 minutes, and then gently massage it to help relieve the pain and soften the nodule. 4. NSAID (Non Steroid Anti-Inflammation Drug), such as ibuprofen, Advil, and Motrin can decrease the swelling and inflammation of the trigger finger. 5. Steroid injection. Injections of steroids near or into the tendon sheaths usually reduce the inflammation of the cyst dramatically; this treatment is extremely effective. 6. Surgery. If none of the treatments above are successful, it is necessary to find a hand surgeon to perform a surgical release of the tendon. Acupuncture is also an effective treatment for trigger finger. The needle should be inserted directly along the nodule (the Archi Point), electrical stimulation should be applied, and ultrasound employed. Acupuncture softens the nodule, after which the needle should be inserted directly into the nodule, and electrical stimulation should be applied to the needle for 30 minutes. The ultrasound that follows can increase the blood flow around the nodule, and these three methods, used together, can greatly decrease the inflammation of the nodule to such a degree that the patient may need no other treatment. Martha underwent the traditional Chinese medicine treatment for 10 visits. Her condition improved so much that she was able to return to work and experienced no more pain. 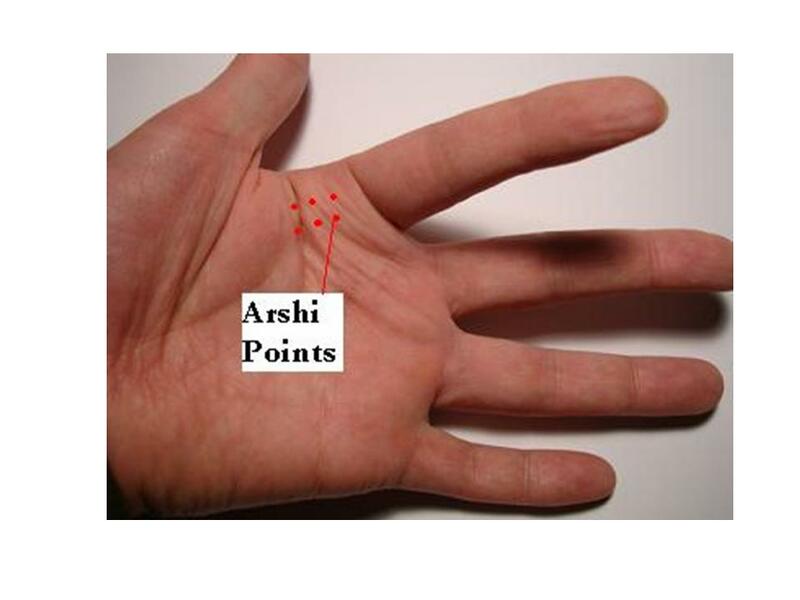 My experience with this condition shows that rest is most important for trigger finger, and the patient must take care not to do any repetitive gripping during this period. In the mean time, you have to immerge your hand into hot water for 10 to 15 min, then massage the joint with massage oil for about 10 min, then after, put ice on the joint about 10 min. The secret is you have to put ice on the joint for 10 min after your massage. Early treatment with acupuncture, electrical stimulation and ultrasound can be used effectively for mild to moderate trigger finger. Surgery, if called for, should only be utilized as a last resort. I’m very grateful for this info as I found it very helpful.I hv this trigger finger since 2 weeks.The internist I saw 3 days ago said nothing other than saying ‘trigger finger’ and gave me ‘Mediflex’.I left her with big question in my head. Luckyly I found this info to begin with.